NEW YORK (Reuters) - Oil prices jumped more than 4 percent on Wednesday as the extension of U.S.-China talks raised hopes of easing trade tensions between the two superpowers, while OPEC-led crude output cuts also provided support. U.S. West Texas Intermediate (WTI) crude <CLc1> futures rose $2.38 to $52.16 a barrel, a 4.8 percent gain, by 1:15 p.m. EST (1815 GMT), the first time this year that WTI has topped $50. Brent crude <LCOc1> futures gained $2.48, or 4.2 percent, to $61.20 a barrel. West Texas Intermediate (WTI) crude <CLc1> futures for February delivery rose $2.38 to $52.16 a barrel, a 4.8 percent gain. The day's sharp gains extended a rally that has pushed prices up more than 13 percent in 2019. "After a dreadful December for risk markets, crude oil continues to catch a positive vibe," said Stephen Innes at futures brokerage Oanda in Singapore, noting that investors were growing less fearful that U.S.-China trade tensions would slow global economic growth and dampen demand for crude. The trade talks in Beijing were carried over into an unscheduled third day, amid signs of progress on issues including Chinese purchases of U.S. farm and energy commodities. State newspaper China Daily said Beijing was keen to end the trade dispute, but that any agreement must involve compromise. Oil prices also have received support from supply cuts by the Organization of the Petroleum Exporting Countries and allies including Russia. The OPEC-led cuts, which officially began in January, are aimed at reining in an emerging glut as U.S. crude output <C-OUT-T-EIA> has surged to a record 11.7 million bpd. Saudi Arabia's energy minister said he was confident that action to rein in output would bring the oil market into balance. Khalid al-Falih also said he would not rule out calling for further action. 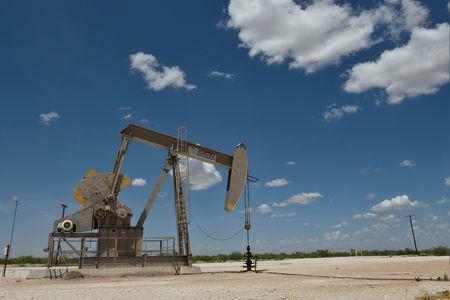 Data from the U.S. Energy Information Administration (EIA) showed domestic crude stockpiles fell less than expected last week. Gasoline and distillate inventories rose more than anticipated. Crude inventories <USOILC=ECI> fell by 1.7 million barrels, smaller than the 2.8 million-barrel draw analysts had expected. Gasoline inventories <USOILG=ECI> rose by 8.1 million barrels, far exceeding analysts' expectations in a Reuters poll for a 3.4 million-barrel gain. Distillate stockpiles <USOILD=ECI> rose by 10.6 million barrels, more than five times the expected 1.9 million-barrel increase, the EIA data showed. "The report is bearish given the smaller-than-expected decline in crude oil inventories and the very large increase in refined product inventories," John Kilduff, a partner at Again Capital Management in New York. Morgan Stanley cut its 2019 oil price forecasts by more than 10 percent. The bank said in a note it now expected Brent to average $61 a barrel this year, and WTI to average around $54 per barrel.